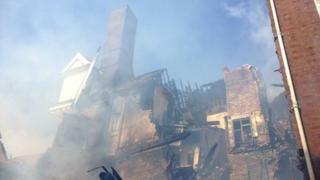 A restaurant fire has destroyed a 17th Century listed building in Suffolk. The blaze at Strada in Bury St Edmunds started in the kitchen on Saturday night and swept through the rest of the building on The Traverse. A member of staff told the BBC about 120 diners and staff were evacuated from the building, which is known as The Cupola House. However the rear of the five-storey building collapsed. No one was injured in the fire. About 80 firefighters tackled the blaze which began at 21:15 BST and some crews are likely to remain there all day. Station Commander John Illingworth, from Bury St Edmunds fire station, said it had been a "very challenging incident". He said: "It looks like a brick building, but it's mostly timber with plaster rendering on the front and timber inside. "Very quickly flames were coming out of the third and fourth floors and it was at that point we decided there was a danger of structural collapse and all our crews were withdrawn. "We're just concerned now with the state of the building and looking at any possible further collapse at the front which is why we have the cordons in place." The rear of the building collapsed just before midnight, covering Skinner Street in rubble. The fire service said it would be taking advice from structural engineers on how best to proceed and an investigation into the cause would take place once the building was made safe. Suffolk Police said Skinner Street, The Traverse, Buttermarket and Cornhill were closed to vehicles. There were also road closures on Guildhall Street at the junction with Churchgate Street, Woolhall Street at the junction with St Andrew's Street South and Abbeygate Street at the junction with Buttermarket. The building was constructed in 1693 for Thomas Marco, an apothecary, and it took its name from the cupola on its roof, which has now gone. It was on English Heritage's Buildings At Risk list, but was removed from it in 2003 after a restoration project.